Schools minister Nick Gibb is crowing, once again, that thousands more children are ‘on track to become fluent readers’. Improved pass rates in the Phonics test show no such thing. The phonics test requires children to pronounce 20 words and 20 non-words and score 32 to pass. The real words are restricted to simple regular spellings: sing, flat, chop, dart, shock, delay appeared this year, with a few more difficult (saucers, groans). It does not check whether children can read very common words such as the, was, any, there, said, come – though it’s impossible to read without them. The non-words used this year included reb, wup, eps, zook, chack, and scrid. The test carefully avoids letter combinations which can be pronounced in different ways eg ou (soup, out, could, soul). There is no requirement to read a full sentence or to know what words mean. an increase of 24 percentage points over a 5 year period. Many hours are spent teaching children how to read nonsense! 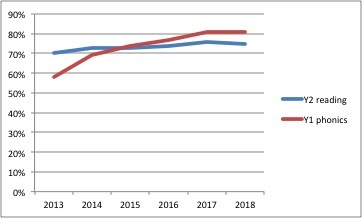 The following graph shows the mismatch (the year is when each batch of children took their Y2 reading comprehension test). 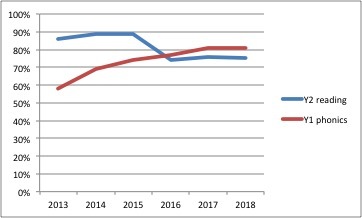 We can show this graphically by adjusting the 2013-5 scores to reflect the increased difficulty of the Y2 reading tests from 2016-8. 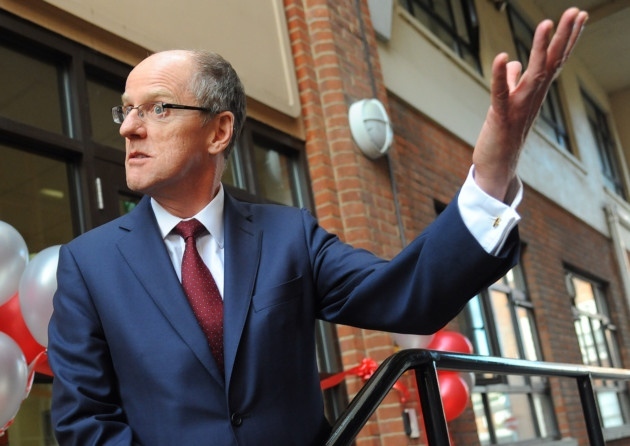 Nick Gibb’s reading miracle is smoke and mirrors. Higher phonics check scores show only… higher phonics check scores. They do not mean children are ‘on track’ to becoming better readers. Immense pressure is being placed on young children. It is significant that 25% of August-born children are failed – and their parents told they have failed – compared with 11% of September-born children. Many children afflicted by poverty are often slower to develop. Not surprisingly, 30% of children entitled to free meals are failed – and their parents told they have failed. This could have a long-term effect on their personalities, development, mental health and attitude to education. This entry was posted in Accountability, Uncategorized and tagged accountability pressures, phonics, phonics check, politicians, testing. Bookmark the permalink.